We don't know to what value set the alt, but perhaps we should create it anyway. The image does not have the alt attr. Hum... the only possibility we have is using the file name, if available. I would even include the extension, to be clear that this is a file name, not really a description. If the file name is not available, then we can just leave it empty. One thing I'm sure is that we can't set alt to an empty value. Other solution would be to bring a simple dialog requesting for alt after the image is uploaded and transformed into a real img. But it would be messy in case of multiple image upload. And at the end it's just an extra work for us. Interesting thing would be to display a summarized dialog with all the images on drop. You can see at the ​image drop mockup. 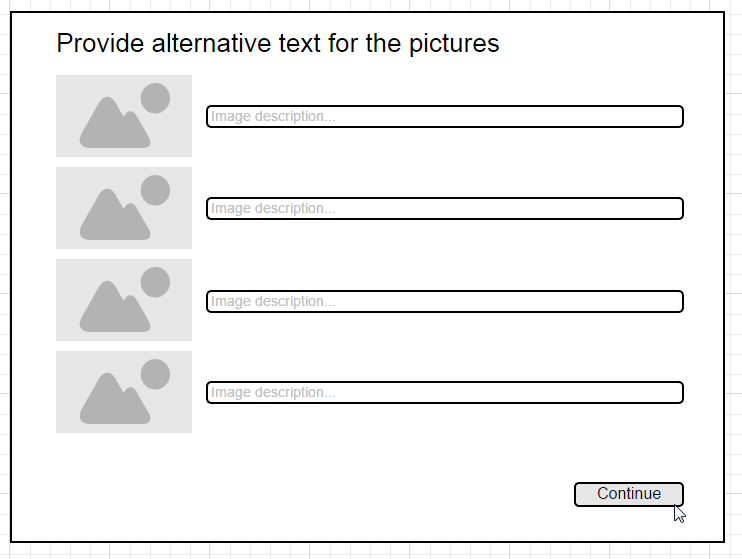 Important thing is that images should already be uploaded when the dialog is displayed, so we won't waste the time. Actually i like this idea, the only drawback is that it would require some additional work. Eventually we might count on external things, e.g. hope that user will remember to set alts for images that he has just uploaded, or that there is a third party tool that will highlight these images without an alt. @fredck - File name it's kind of pointless I'd tell. It will be provided anyway as a standard fallback if no alt attr is present. The only benefit here is that begining of the path would be stripped. @m.lewandowski, my point was bringing a non-blocking/cheap solution for it... the "better than nothing" thing. I also thought about dialogs, but this will envolve a much bigger research and discussion, which will not be done for the 4.5. Ok but don't you think that this temporary (adding a file name) solution will only hide the real problem? I mean, assume that user has a plugin (or server side validator) that will validate produced HTML with W3C validator, or similar soft. Assinging filing name as an alt will render W3C validator useless. As for custom validators, we'll require them to check if alt is not the same as the file name. This may be true... therefore I would opt to remove the milestone for this ticket as we'll not be able to bring a solution for it at this stage.